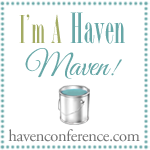 Last weekend, Courtney and I attended Haven, the blogging conference here in Atlanta. I knew it was something special but had no idea how big it really is. I first heard about Haven last year when Courtney told me she tried to buy a ticket for me but they were sold out. So when I learned that this year's tickets would go on sale January 1st, I watched the clock and waited poised in front of my computer only to find out that the "early bird" tickets were already gone. First Lesson Learned: Bloggers are f-a-s-t! I know some of you will be traveling to Atlanta today for the Haven Conference and will be depending on Google Maps and Navigator. As someone who lives here and loves Estate Sales I finally get out and about in my neighborhood and the "burbs."